In medium bowl, stir together double chocolate chunk cookie mix, oil, water and 1 of the eggs until well combined. Set aside. In another medium bowl, stir together sugar cookie mix, softened butter and remaining egg until well combined. Between 2 sheets of cooking parchment paper and using rolling pin, roll sugar cookie dough into 18x12-inch rectangle. Remove top sheet of paper. Spoon chocolate cookie dough evenly over sugar cookie dough. Return paper to top of chocolate cookie dough. 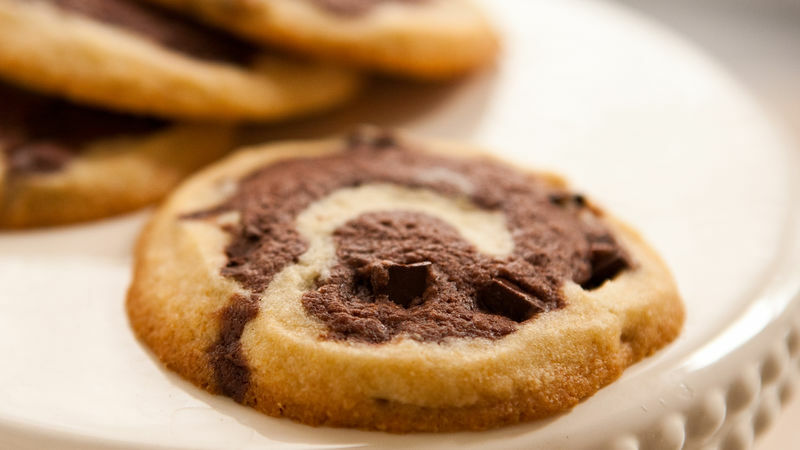 With rolling pin, gently roll chocolate cookie dough into even layer over sugar cookie dough. Remove top sheet of paper. Starting with one 18-inch side, roll up dough into a log. Wrap log in bottom sheet of paper. Refrigerate until firm, about 2 to 3 hours. Heat oven to 350°F. Spray cookie sheets with cooking spray. On cutting board, cut chilled cookie dough into 1/2-inch slices; place 3 inches apart on cookie sheets. Bake 14 to 16 minutes or until edges are light golden brown. Cool cookies on cookie sheet 2 to 3 minutes. Remove from cookie sheets to cooling racks. Cool completely before serving. Store cookies in airtight container. To prevent cookies from browning too much, run cookie sheet under cold water for a few minutes to cool it in between cooking batches of cookies.